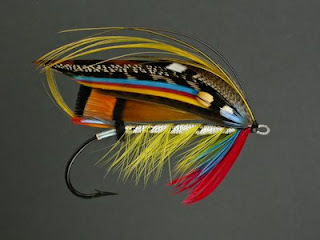 This fine Salmon Fly, called the Murdoch, was tied by my friend Eric Austin so that I could photograph it for a photo print competition at my local camera club. The theme that month was "outrageous color" and with this digital image I was able to score high enough to get a first place. At the end of the club's season I submitted it again, but this time for the "Print of the Year" competition in the assigned theme category. (Besides the "assigned theme" each month we also have "open" and "nature" categories.) I was very pleased that again the print (an 8"x10")received first prize! This is the first (and only) fly photo I have ever printed. And I must say, prints look far nicer than do images on computer screens. The colors are richer and on good print paper there is a certain depth and substance to the image that just isn't there when viewed on screen.